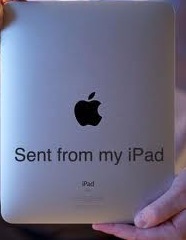 If you did not already have an iPad or other tablet before Christmas - you probably do now. Tablet computers were the rage of the holiday. The number of adults with a tablet went from 10% to 19% in less than a month (Pew Internet & American Life Project). If you include e-readers, the market penetration among adults is 29%. Apple was so successful that they overtook Exxon as the largest company in America. I use Hootsuite for monitoring social networks including linkedin, facebook, and twitter feeds. It is super handy when I am at conferences or meetings. I use Evernote for taking notes and capturing webpages. I have a lot of media apps - CBS, NBC, Fox, ABC, ESPN, WSJ, NYTimes, Washington Post, Sun (London and Hong Kong). I have all of the productivity tools for pdf, word processing(pages), spreadsheets(numbers), presentations(keynote) - love that. By the way - if you want to use your iPad for presentations, you can pick up a connector at any apple store. I use iCloud to keep all of my contacts and calendars etc. synchronized across all devices. I like DropBox for storing and sharing large documents and images that cannot be emailed. This is a really handy way for me to save my presentations to my iPad, and make them available at conferences for the audience to download. I use a number of publishing tools to manage my websites - but I do not suspect that those are important to many of you. For example - I use the Blogger app for this blog and the Wordpress app for WAV Group. For movies, I use Netflix, but also use the Ted App a lot for inspired videos. I also have HBO Go, which comes with my cable subscription. For real estate, I use zillow, trulia, Century 21 and Realtor.com's apps. I must confess - I really do not use them a lot - more for research purposes and to watch what everyone it doing. I like Yelp for restaurant ratings, but also use Foursquare. I make reservations using OpenTable when necessary. I use the Kindle app for purchasing books - more selection in the amazon store than the Apple Bookstore. I like TripAdvisor for foreign travel - it was great in Italy last summer. Our Choice is a really cool environmental app done with support from Al Gore - it is a great tool for teaching children about the environment. It really explores the bounds of interactive magazines. Whistle turns my ipad into a phone - that is cool. If you have a company or market a product - you may want to take a look at this article - it has a lot of breakdowns on who is adopting these handy mobile devices. The Men vs. Women may surprise you. Have you tried Team Viewer? The app give you yhe ability to have remote access to any computer and the applications. Very convenient and easy to use. And it's free.